When that fumble happened, I didn’t know how to handle it, because I wasn't used to failure. I was the kid who had over-achieved on the football field and surpassed everyone's expectations. When my quarterback told me in college that I could make it to the NFL, I thought he was joking. We were playing at Newberry College in South Carolina, a Division II school, and only two people from there (Ron Parker and Kamaal McIlwain) had ever made it to the NFL. And nobody had ever been drafted. 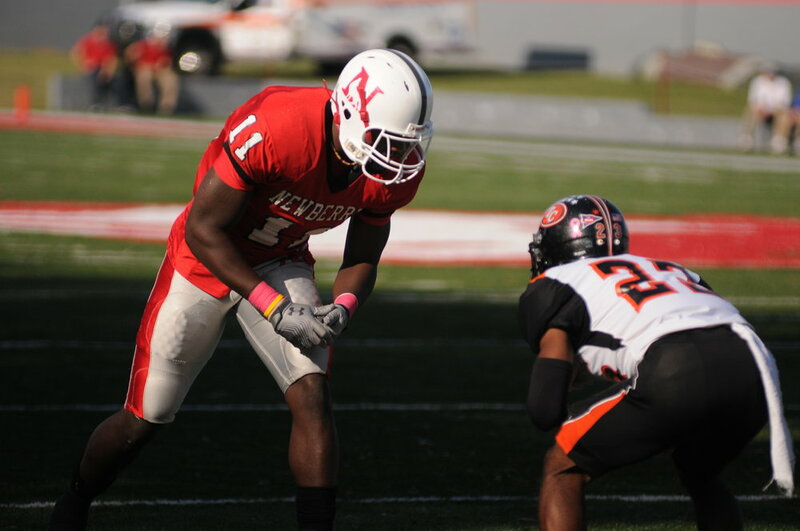 I was different than a lot of Newberry athletes, because I probably should have been a Division I athlete. The thing was I had struggled academically when I was younger, and D1 teams didn’t want to take a chance on me. Maybe they looked at me like a project or they assumed I was undisciplined. All I know was that I couldn't find a major program that wanted me, so I headed off to Newberry. If I didn’t understand right away that I was at the D2 level, I quickly got a reality check when it came time to get our equipment. All the little things that most D1 players don't even think about - like cleats and tape - we had to pay for all of that. And when you’re broke like most college kids, spending $100 on cleats isn't always the easiest thing to do. On the outside I felt like a Division II athlete, but once I stepped on the football field, I quickly made a name for myself. God blessed me with size and speed, and as a receiver I used that to my advantage. I was bigger than most of the defensive backs I went up against, and with each game I started to gain more notoriety. Then came the game against Sanford, a 1-AA school who had a future NFL draft pick in their secondary. I knew this was my chance to make a mark, and after having a good game I felt I actually had a chance to maybe reach my NFL dream. Just when it felt like I maybe belonged with the other elite college players, I got another reality check when it came time for pro day. For D1 programs, as the weeks approach to the NFL draft, they hold a workout for their seniors as they invite NFL scouts to watch. Newberry’s pro day only had a few scouts, so I tried to work out at the pro day of an SEC school. They told me no, so I decided to head over to Division 1-AA (also known as FCS) to Coastal Carolina. Josh Norman, the star cornerback for the Redskins, was playing there at the time, so enough scouts were able to get a good look at both of us. That unfortunately didn't translate into a draft pick. I heard rumors that I might get picked up by the Steelers in the 7th and final round, and then I watched on tv as Roger Goodell said "With the 248th pick in the 2012 draft, the Pittsburgh Steelers select.....Kelvin Beachum from Southern Methodist University." I called my agent like "What's going on?" and found out that the Steelers had decided to go in a different direction. After the last few picks went by, that was it. The draft had concluded, and I didn't have a home. I decided to head back to South Carolina and work out, and that's when I got the call from my agent. I had landed a workout with the Green Bay Packers. It was a workout, not an offer, but by this point I was used to breaking down barriers. So off to Green Bay I went, with one goal in mind - to play in the NFL.